Do not hesitate to explore every procurement option available when an immediate or long-term need arises. The decision to rent versus buy is one that requires thoughtful planning and consideration of all factors. However, there is no easy calculation to determine when it is the right time. Aside from all of the internal scenarios that need to align—budget, staffing, etc.—there can be unexpected outside regulations that suddenly become factors as well, such as governing rulings on air quality, alternative fuels or safety. Knowing it is not an exact science to determine which route is best for your business, there are a number of considerations that can help sway the decision. What is the Truck Selling for? Do your research to see what others across the country are asking. Evaluate the benefit of any upgrades or add-ons, but also subtract the estimated value of any issues or shortfalls. Keep in mind that not all dealers are providing the same quality of product. While research on the truck itself is required, it is also important to consider the reputation of the seller. Buying a truck because it has the lowest dollar amount does not always mean it is the best buy. The always-prevalent topics surrounding garbage truck fleets (e.g., maintenance, age, mileage) should be calculated into this price evaluation. If considering a loan to purchase a truck, keep in mind the math involved after the sale is complete. Factor in the interest rate, length of loan as well as down payment amount. These variables could potentially add up to be more than what your business is willing to take on. How long will the business need the truck? Is this driven by an immediate need or consistent/significant business growth that demands additional assets? Savvy fleet owners, large and small, see a rental as a highly effective tool and readily incorporate it as part of a well-rounded operational strategy to meet short-term/seasonal contracts, rapidly respond to unforeseeable demands, mitigate financial risk and maintain predictable monthly budgets. On the flip side, if opportunities for substantial long-term contracts arise, buying becomes the most attractive option versus the slightly higher costs associated with renting, and provides an owner with immediate tax-related benefits such as asset depreciation and certain other expense deductions. There is also a third option that many fleet owners have consistently turned to over the years in order to maintain flexibility in the face of immediate demand, as well as prepare for future growth: Rent-to-Purchase. This is where a percentage of the monthly rental rate is applied to a pre-determined purchase price should the user decide to buy the asset following an agreed-upon rental term. Either way, timing and anticipated length of use should inform any decision to rent, rent-to-own or buy outright. While brand new trucks may promise moderate-to-long shelf lives, it is no surprise that brand new trucks are more difficult to secure. The new technology offered in up-to-date models can be beneficial for drivers and businesses alike. Conversely, used refuse trucks (under the right circumstances) can often offer viable, cost-efficient solutions. Late model trucks offer similar technologies to brand new refuse trucks; however, the evolution from early 2000s technology is considerable enough to be noticeable. Again, factors such as age, upkeep, and mileage are critical in evaluating used trucks. Keep in mind that buying a new refuse truck is not a one-time flat fee; there are maintenance costs required for upkeep that go on years after the sale is complete. It is important to consider factors such as the age of the truck, condition of the truck and environments that it will be used in so that you have some understanding of foreseeable maintenance costs over the next decade. Of course, one should also consider the unforeseeable maintenance required and assume that those additional expenses will be coming. Also consider administrative costs for managing DOT compliance. When is Renting the Right Option? Does this recurring cost make sense for your business? Is it ultimately going to help you free up the capital you need, or does the monthly hit take away from your bottom line? Do the terms of the rental match your needs? It typically does not make much sense to lease a truck for 12 months if you only need it for two. The excessive fees coming out of your budget could show that your fleet is not running as efficiently as it could. Can you count on this rental truck to get the job done? If the truck type does not match your need or the vehicle is at risk of breaking down quickly, then it probably does not make much sense to add it to your fleet. Make sure you that are working with a company that you trust and will be there to support you when you need it. If something goes wrong with your rental or you need a fast solution, are you going to be left in the dark? These sorts of questions are particularly important in short-term leases, so renters do not spend their rental period without a functional solution. Other factors worth considering include residual responsibility, rental terms and conditions, upcoming seasonal demand changes or the likelihood of immediate truck availability in your area. Even with all factors considered, there may not be a clear “right” answer. Evolving businesses have constantly changing needs, which could change some of your answers to the questions presented down the road. So, how do the most efficient fleets get to that level of efficiency? It is usually a combination of renting and purchasing. They use projections and trends to determine when a short-term solution is best and work out appropriate rental terms. They also recognize growth and opportunities that call for more resources and capitalize when they can. Knowing your business and thinking through these considerations is the only way you are going to be able to make an informed decision. Whether seeking temporary solutions to immediate demands or preparing to capitalize on substantial growth opportunities down the line, the most productive fleet owners and managers have a few significant things in common. First, they do not hesitate to explore every procurement option available when an immediate or long-term need arises. Second, they understand that the least expensive option is rarely—if ever—the best choice for consistent financial and operational success. And, finally, they accept their equipment providers as trusted partners in a joint effort to find the best solution to meet their specific fleet needs and drive home production. Jason Bailey is the Director of Route Ready Sales at Route Ready, a leader in North America’s new model/low hour waste collection truck market and a division of Big Truck Rental (Tampa, FL). Route Ready is known for its high quality, readily available off-rent refuse trucks and range of reconditioning options that meet every budget and delivery demand. 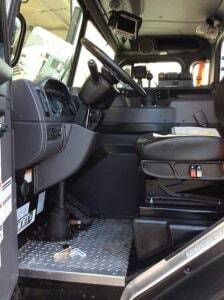 For more information on available inventory, reconditioning tiers/extended warranties, and procurement options offered through Route Ready, visit RouteReadyTrucks.com.